.... More than a dozen flu experts contacted by Nature say they believe that the work opens up important vistas in basic research, and that it sends a valuable warning about the potential for the virus to spark a human pandemic. But they caution that virus surveillance systems are ill-equipped to detect such mutations arising in flu viruses. As such, work on the viruses is unlikely to offer significant, immediate public-health benefits, they say. Again... where was the initial thoughtful, insightful oversight that is claimed to guide and regulate taxpayer-funded research? I repeat: We ought to destroy all the petri dishes, all the records, everything we have that might allow us to move forward with this line of research. The researchers themselves ought to be forced into retirement and banned for life from having any contact with any germ lab. Oversight committees that approved the research ought to be disbanded and new more rational people selected to serve on them. Agencies that approved and funded the research ought to be purged of anyone who voted for or signed off on the approval of funding this absolute insanity. Jan 25, 2012 (CIDRAP News) – Breaking a prolonged silence, the author of one of two controversial studies dealing with mutant H5N1 viruses said today that the virus his team created went airborne to spread among ferrets, but it didn't kill them. When I was injected in the back of the neck I was being held in isolation, so I was unable to discuss what had happened with other detainees. A year passed before I was eventually able to see and communicate with fellow detainees, and I am unable to remember today if I discussed that particular personal experience with them. We did discuss medical experimentation in general however. A detainee with UK citizenship described being injected daily, resulting in one of his testicles becoming swollen and racked with pain. Along with these daily injections he was subjected to mind games by interrogators, medical personnel, and guards whom worked as a team. Under these conditions they were able to extract written false confessions from him. How I experienced the injection at the base of my neck is described in detail in my book. In a nutshell, I felt my soul had been violated. That is just one experience I had with medication. There were many pills and injections, plus constant blood tests over the years. Everybody regardless of their citizenship should acknowledge that medical experimentation, whether on human beings or animals, is unacceptable. As with animals, we were held as prisoners when these procedures were forced upon us against our will. And as with animals, we were voiceless. A message that will be lost on many. I've mentioned many times how cruel, dull, insensitive, distrustful, and contriving I find members of the vivisection industry to be. I've mentioned UW-Madison's Harlow Lab director Chris Coe by name a couple times. See for instance The Biology of Iron and Christopher Coe on Res 35. Or, just stick "Coe" into the little search window at the top of the page in the upper left. But I'm going to have to add gullible to my list of descriptive adjectives. The forums have been a sham but they have nevertheless fooled even those they are meant to shield. The most recent forum featured a presentation by Andrew Rowan of the Humane Society of the United States. He gave an interesting talk, but had no specific knowledge about anything having to do with the university's use of animals. Here's the silly connection with Coe: When he heard that Rowan was coming he sent the members of the forum committee information that he claimed exposed HSUS for what it really is. His information about HSUS was Rick Berman's industry-funded HumaneWatch.org. Really? So much for critical thinking. H5N1: "the world will hold life sciences accountable"
LAURIE GARRETT. January 11, 2012. Capital Times. This is an interesting and informative piece; it's good that the Cap Times published it. As interesting and apparently well-researched as this article is, it fails to call attention to the history of accidents associated with research involving dangerous infectious diseases. The level of risk from terrorists using germ warfare seems low when considered against the history of problems that have resulted from things like poor maintenance of rubber seals and ventilation systems in supposedly secure laboratories, workers becoming blasé about biosafety, and plain old mistakes and accidents. Lyme disease takes its name from Lyme, Connecticut. 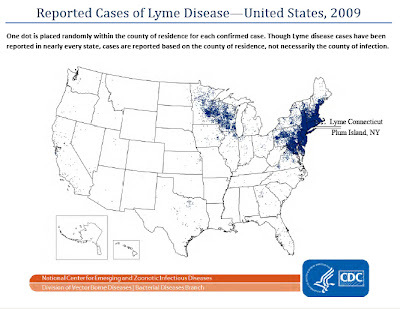 (I marked Lyme and Plum Island on the map above.) Some people consider it more than coincidental that tick-borne diseases were being studied at USDA's Animal Disease Center on Plum Island, when the disease emerged in the US population. Plum Island, "The Safest Lab in the World" has also been suggested as the US doorway of West Nile virus, and duck enteritis. For much more on this see Lab 257: The Disturbing Story of the Government's Secret Plum Island Laboratory. The likely cause of the 2007 outbreak of foot-and-mouth disease in the United Kingdom, which resulted in thousands of animals being destroyed and costing billions of pounds, apparently was traced to leaky sewage pipes damaged by tree roots. The laboratory itself maintained good biosafety standards apparently, and still, a breach occurred. (See too 'Safety incidents' at animal lab. May 2011. BBC.) Even after the 2007 disaster, accidents continue. Accidents are just a part of life; they happen, accidentally. There are no absolutely fail-safe systems. (Austin, 18 April 2005) - A leaky aerosol chamber manufactured by the University of Wisconsin at Madison was responsible for three laboratoryhttp://www.blogger.com/img/blank.gif-acquired tuberculosis infections in a Seattle BSL-3 lab last year. The infections have not been made public until now. Nearly twenty Madison chambers exist across the US and in India, New Zealand, and Northern Ireland. While tuberculosis is not a biological weapons agent, the accident underscores the inherent dangers when working with dangerous disease agents, and the grave safety risks of the US biodefense program, which is encouraging more scientists to deliberately aerosolize bioweapons agents in Madison chambers and similar equipment. Presumably, the UW-Madison engineers who designed and oversaw the production of these foolproof biosaftey cabinets had absolute trust in them. And yet, many accidents involving very dangerous infectious diseases involved them. Accidents happen. See too: Texas A&M University Violates Federal Law in Biodefense Lab Infection. The Madison aerosol exposure chamber was developed by the University of Wisconsin in 1970 as a stand-alone system designed for total body exposure of animals as small as mice or as large as rabbits. The chamber, which can hold up to 90 mice, allows researchers to simultaneously infect large numbers of animals. It is essentially a pressure vessel that contains a nebulizer, which is filled with a particular agent that is drawn through the chamber to completely expose the animals. During exposure, the aerosol is contained within the system and a purge cycle following aerosolization reduces lingering agents. The chamber, designed for specialized BSL-3 and BSL-4 labs, is being used today to study tuberculosis, bioterrorism agents, anthrax, and any research that requires the infection of a large number of animals. In recent media coverage of this new-to-the-world most-deadly-flu-ever, UW-Madison's William Mellon, who oversees the university's program for pathogens and toxins, has been saying that biosafety and security at UW-Madison "are among the most rigorous in the world." I don't know whether Mellon is intentionally lying, but he isn't being entirely forthcoming. And while, if given the chance, the UW-Madison biosafety oversight system might function as well as similar systems elsewhere ("most rigorous in the world" is clearly hyperbole) accidents and mistakes still occur. Today, biologists can insert genes directly into germs' genetic codes and give them characteristics that do not occur in nature. One of the characteristics that can sometimes be inserted is a resistance to the antibiotics used to control the germ. Research involving the artificial of creation of antibiotic resistant germs is termed a "Major Action" under the NIH Guidelines, and requires specific permission to do so from them. The claimed benefits from inventing new-to-the-world diseases may or may not be accurate, but the risks are real. The scientist at UW-Madison involved in the invention of the new deadlier-than-ever bird flu is Yoshihiro Kawaoka. Kawaoka knows a lot about viruses, but he has a history of being a little too unconcerned about the risk to his neighbors. He was working with Ebola in his UW-Madiswon lab, and asked the NIH for permission to reduce the level of biosafety measures he was using. In 2005 and into the summer of 2006, researchers at the University of Wisconsin at Madison (UW) made and manipulated copies of the entire Ebola virus genome without proper safety precautions. 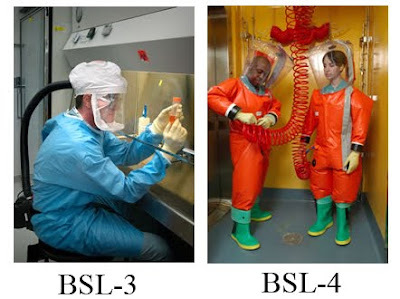 Although federal safety rules required a maximum protection Biosafety Level Four (BSL-4) lab for the research, UW allowed it to proceed at the much less safe and secure BSL-3 level. The rules that UW broke are intended to ensure that agents that are easily transmissible and usually incurable don't escape maximum containment. 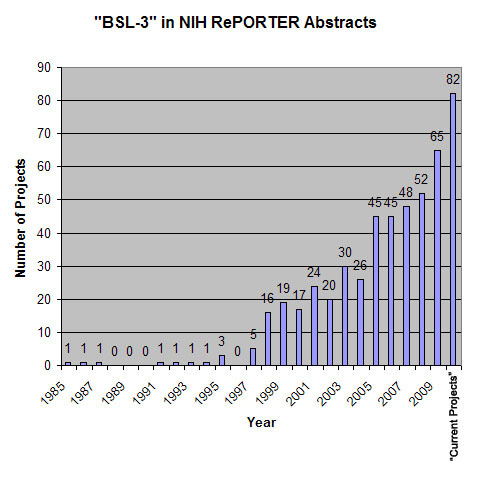 They prohibit working at BSL-3 with Ebola (and similarly dangerous) virus material that has not been rendered irreversibly incapable of reproducing. UW does not have a BSL-4 lab suitable for handling Ebola virus, which is one of the most dangerous pathogens in the world. Hospital beds were ready; isolation wards at hand. This time, the country would take care of its soldiers and get them back in action as fast as possible. We had learned the lesson: hygiene and quarantine were key. The lowest estimate of the pandemic's worldwide death toll is twenty-one million, in a world with a population less than one-third today's. That estimate comes from from a contemporary study of the disease and newspapers have often cited it since, but it is almost certainly wrong. Epidemiologists today estimate that influenza likely caused at least fifty million deaths worldwide, and possibly as many as one hundred million. The 1918 Spanish flu is the most deadly disease yet encountered during historical times. The new-to-the-world super-flu invented by Kawaoka and Ron Fouchier is thought by some to be just as deadly, and perhaps even worse. The institutions, labs, and the researchers that already have and those that might might gain access to the recipe for making this potentially species-eliminating new plague are mere humans, possessing all the weaknesses of distraction, hubris, and greed that affect everyone else. No knowledge is so valuable, so important, that its possession trumps such grave risk. The history of biosafety failures -- many more than are mentioned here -- ought to give us pause. We ought to destroy all the petri dishes, all the records, everything we have that might allow us to move forward with this line of research. The researchers themselves ought to be forced into retirement and banned for life from having any contact with any germ lab. Oversight committees that approved the research ought to be disbanded and new more rational people selected to serve on them. Agencies that approved and funded the research ought to be purged of anyone who voted for or signed off on the approval of funding this absolute insanity. Where are the Madison medias' stories on this? Their silence is deafening -- and potentially deadly. They ought to be ashamed. Vivisectors uniformly argue that medical progress is dependent on their continued access to animals. Their lobbying organizations work diligently toward more or less unfettered freedom for vivisectors to treat animals as they wish. They never make the claim so baldly, but their actions -- like the University of Wisconsin successfully lobbying state lawmakers in 2011 to exempt them from the state's anti-animal cruelty laws -- speak volumes. How perplexed they must be when the director of NIH -- the gravy train that keeps the vivisectors in cars, boats, and vacation homes -- says that vivisection might not be all that the vivisectors themselves claim it to be. Director Francis S. Collins understandably dances around the matter; the nation's large universities and the giant suppliers of animals, cages, and tools of torture, are a hornets nest that only the stouthearted would disturb without care. Even the director of the NIH hopes not to lose his job. Nevertheless, it's hard to look at the gigantic failure of the American biomedical research endeavor and pretend not to notice the key detrimental role that vivisection has played. The quotes below come from Director Collins's Commentary: Reengineering Translational Science: The Time Is Right. www.ScienceTranslationalMedicine.org 6 July 2011. Collins: "The average length of time from target discovery to approval of a new drug currently averages ~13 years, the failure rate exceeds 95%, and the cost per successful drug exceeds $1 billion, after adjusting for all of the failures." Collins: "The upstream component of this developmental pipeline is progressing vigorously, aided by dramatic technological advances and associated basic insights into disease mechanisms ... The downstream end—premarket clinical trials—is traditionally the strong suit of the private sector because of its considerable expertise in assessing promising interventions. However, serious problems exist in the middle zone, in which attrition rates for candidate products are horrendously high. Many of the complex steps in this middle zone have been performed in the same way for a decade or more and have not been subjected to the kind of bold innovation that has characterized other branches of biomedical science." Collins: "Current trends are indeed disturbing. Over the past 15 years, the annual rate of approval for drugs that address a new target class has not kept pace with the substantially increased investments that have been made in research and development." Collins: "The use of small and large animals to predict safety in humans is a long-standing but not always reliable practice in translational science. New cell-based approaches have the potential to improve drug safety prediction before use in patients." Collins: "The use of animal models for therapeutic development and target validation is time consuming, costly, and may not accurately predict efficacy in humans. As a result, many clinical compounds are carried forward only to fail in phase II or III trials; many others are probably abandoned because of the shortcomings of the model. Building on a potentially extensive network of collaborations with academic centers and advocacy groups, NCATS will aim to develop more reliable efficacy models that are based on access to biobanks of human tissues, use of human embryonic stem cell and induced pluripotent stem cell models of disease, and improved validation of assays. With earlier and more rigorous target validation in human tissues, it may be justifiable to skip the animal model assessment of efficacy altogether." Sacrilege! Collins: "Using as few as one or two human volunteers, phase zero trials allow in vivo testing of very low doses of appropriately labeled novel therapeutics to assess appropriate distribution to the desired target. Through access to academic research centers that received NIH Clinical and Translational Science Awards (CTSAs) and the NIH Clinical Center, NCATS can encourage further development of phase zero technologies such as positron emission tomography–ligand–assisted molecular imaging and metabolomics to provide a more direct pathway toward optimizing formulation, dosing, pharmacokinetics, and pharmacodynamics rather than depending so heavily on animal testing." These observations can't be good news to many within the industry. The National Institutes of Health (NIH) is informing the research community that it accepts the recommendations of the Institute of Medicine (IOM) in its report Chimpanzees in Biomedical and Behavioral Research: Assessing the Necessity. As a result, NIH announces that it will not fund any new projects for research involving chimpanzees while the Agency considers and issues policy implementing the IOM’s recommendations. Go ahead, call me a silly wide-eyed optimist, but if enough people knew what was being brewed in Yoshihiro Kawaoka's University of Wisconsin, Madison laboratory, I think they'd raise an eyebrow. No local media outlet seems disposed to do much reporting on Kawaoka's apparently successful invention of what may well be a virus even more deadly than the 1918 Spanish flu, the most deadly disease yet encountered by humans, which he helped resurrect from extinction. His newest creation is likely to be even more deadly: a very fast-moving, global, species-eliminating, viral epidemic, should his newest invented virus escape from his lab. No local media outlet seems disposed to mention his Ebola problems, or UW-Madison's history of biocontainment problems, or researchers' biosafety problems, or the university's misleading public statements about potential risks to the public. University officials work for an institution which skims literally millions of dollars from Kawaoka's NIH-funded research -- they skimmed over $500,000 in 2011 alone. (Universities negotiate what are called "indirect costs" with the NIH, and then take that amount from NIH grants received by grant recipients. UW-Madison is taking about 40%.) The institution is too financially vested to fairly evaluate the risk to its neighbors -- and every other person on the planet -- and defends Kawaoka's very dangerous work by saying that his lab is absolutely, 100% safe and secure. Pay no attention, they say, to this ticking bomb. In 2005 and into the summer of 2006, researchers at the University of Wisconsin at Madison (UW) made and manipulated copies of the entire Ebola virus genome without proper safety precautions. I am writing with concern regarding the recently completed BSL-3 Agriculture laboratory at the University of Wisconsin, Madison. I understand that the university will be seeking a required CDC inspection of the lab prior to its commission. As you may know, this lab will be dedicated to research conducted by Dr. Yoshihiro Kawaoka. Recently, it was discovered that Dr. Kawaoka was conducting research with Ebola at the university in a BSL-3 lab and asked for permission from NIH to conduct the research in a BSL-2 lab. NIH responded that the research should be conducted in a BSL-4 lab. Prior to that, Dr. Kawaoka was apparently conducting research using the 1918 Spanish flu in his Madison lab, and was ordered to stop. It seems that there is a general tendency in Dr. Kawaoka’s lab to ease biosafety regulations. This is worrisome given the deadly nature of the organisms he studies. I urge the CDC to deny the University of Wisconsin’s request for an inspection of the lab. I urge CDC to find some way to drastically limit the agents that Dr. Kawaoka will be allowed to bring into any lab. The last thing we need is a 1918 outbreak or the release of a mutated strain of Ebola. If you are not the appropriate CDC official regarding this matter, please forward this letter to the appropriate officer. cc Julie Louise Gerberding, M.D., M.P.H. Say what you will, but when others are all coughing up blood, unable to drag the dead from their homes, and are wondering what in the hell happened, I'll be dying too, but at least I'll know more or less what happened and more than a few of those who are to blame.